…but not so many photos. We have been eating especially well this past week, but I didn’t get pics of most of it. Last Friday night we had a (sadly unphotographed) crustless broccoli quiche. I’ve made this recipe before, and it always comes out nicely, though the broccoli was no longer as fresh as I would have liked. 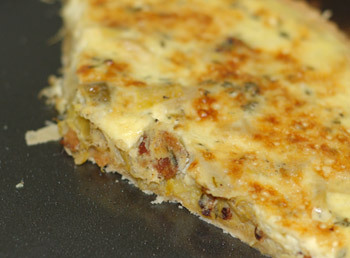 On Saturday, I made the leek and bacon tart from All About Braising . It came out really wonderfully, but took longer than I thought it would, so we ate kind of late. I made the crust in the Cuisinart on Friday night, so it was ready to roll on Saturday, but I missed the bit where the crust also needed to blind bake, so that added to the prep time. I froze the rolled crust instead of waiting for it in the fridge for 45 minutes, which saved a bit of time, but it still shrunk up somewhat, despite my pie weights. Because of the shrinkage, I couldn’t use quite all the leeks or all the filling, but I wrapped the tart pan in foil and got it on a baking sheet ready to go before pouring the filling, and that helped avoid spillage. Then I somehow managed to turn the oven off when I was supposed to turn it down to 350F, so I came back looking for a finished tart after 40 minutes, and found a soupy one instead. Doh! It was still darn hot in there, but obviously not quite hot enough, so I got the oven back on, and 15 minutes later, the tart was golden brown and set. I was all prepared to discuss how the end result just wasn’t worth the effort and frustration… but it totally was. This tart was absolutely delicious, and worth every bit of the work and more. We only wish it had been bigger, because by lunch the next day it was all gone. On Sunday I made a balsamico roast chicken from Italian Country Table . It tasted pretty good, but wasn’t very photogenic, and the potatoes that went with it were nothing special. Mostly it just seemed like extra work for not that exceptional result; or maybe I’m just jaded now because the Keller chicken was the easiest thing ever to prep and was awesome. 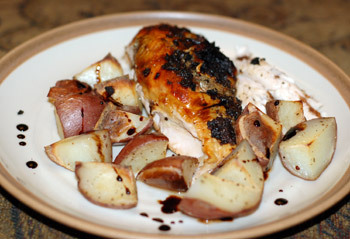 I did make a balsamic reduction to serve with this balsamico chicken, and that was probably the best part of the meal. Kasper mentions eating chicken in this way in Italy with a drizzle of aged balsamic, and since the oldest balsamic we can afford is 10-years old, reducing some of that gave it some syrupy sweetness and complexity. Monday night was a repeat of this meal, because it’s asparagus season. I made fresh touch-of-grace biscuits to go with it, though, and drizzled some balsamic reduction on the side because we had it and it was tasty. This meal doesn’t really need that sort of embellishment, though; it is incredibly flavorful and elegant anyway. On Tuesday night, I stopped by the grocery store for some staples, and came home with the makings for smothered pork chops. I used the recipe from All About Braising , which is probably the cookbook I have gotten the most mileage out of, followed closely by Marcella Hazan’s Essentials of Classic Italian Cooking . 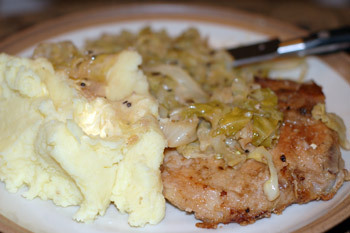 The pork came out nicely, even though I couldn’t find any that were an inch thick, and the creamy cabbage was fantastic (and I don’t even like caraway). I used lovely thick sour cream and a drizzle of heavy cream in place of the creme fraiche, and served it all together with some Yukon gold potatoes that I steamed and passed through my new ricer. We gave the puppy a few bites of pork after we had taken our plates away, and she liked it so well she actually started learning the “down” command, which is a big development. Last night, I made a white bean chicken chili from the leftover roasted chicken (what amounted to about half the chicken). I adapted this recipe from Epicurious to our tastes and available pantry items, and it came out beautifully, thick and just spicy enough. This will certainly be a good addition to our repertoire of chicken leftovers recipes. I also made a batch of gooey bittersweet brownies with a coconut topping last night, a recipe from Alice Medrich’s Bittersweet that I’ve made before and think is fantastic. They were incredibly gooey and messy to eat warm from the pan, but firm up just enough to eat neatly when they cool, and are eye-rollingly rich. I used 70% bittersweet Scharffenberger chocolate this time, and it worked perfectly. I think I led Jeremy to believe that the topping would more closely resemble German chocolate cake frosting, so he commented several times about the coconut drying out, but actually the topping is more like American macaroons: made with egg white and white sugar, crisp and golden on the outside, and a bit sticky on the interior. I like it very much, but it is definitely a different animal than German chocolate frosting. What’s on the table tonight? I think I’ve earned a break. FFYS!